More than any other club in your bag, the putter is the most personal and -- for most of us -- the most intimate of player/club relationships. Many of us still have our very first putter, or the one we made our first birdie with, or the one we shot our lowest round with, etc. While the best putter for you is the one that gets the ball in the hole, there are some differences -- in both design and performance -- that will help your putting game, whether you shoot 72 or 102. There are two basic types of putters: Blade and Mallet. A blade putter is narrow (front to back) and often incorporates extra weighting in the heel and toe of the putter head. The shaft can be attached in any number of ways, but in general is aligned more closely with the center of the club head. A mallet is often as deep (or deeper) than it is is wide. Again, shafts can be attached in any number of ways. Mallet style putters often feature additional "alignment aids" and, due to their larger size, are generally effective with this technique. Within each of these two categories are an infinite number of variations on each type. The putter is easily the most varied piece of golf equipment -- almost hard to believe when you look at the number of drivers available these days -- but true nonetheless. Some good performance and good buys in used mallets are the original Zebra putter (Zebra Golf), the TaylorMade Rossi Monza model and the Odyssey (Callaway) Two-Ball putter. The important thing for a beginner to remember is to try out as many putters as you can, until you find the right one for you -- a putter you feel comfortable and confident with. In time, your putting average will come down and you'll have fewer three-putts and more one-putt greens. This is perhaps the toughest category to highlight a putter for. Your game is good enough that most any putter on the market could work for you, be it mallet, blade, or anything else that might be available. Yet there are some things to be aware of as your game progresses and your putting becomes more consistent. As you have passed through and beyond the beginning golfer stage, your putting stroke has probably gotten more consistence, reliable, and even. However, if you're still in this stage, chances are your stroke lets you down in one of two ways: either your distance control or direction. Since harnessing both of these is critical to good putting, let's take a look at what putters can help you improve each of these areas. Distance Control: perhaps more even than direction, nothing is more frustrating than hitting your putt exactly on the line you want, but having it come up 6 feet short, or blast 10 feet past the hole. If you generally play on very fast and firm greens, then a heavier putter is probably best. If you play more on rougher, slower greens, then a lighter putter might improve your overall performance. You may have reached the point in your game where getting fit for a putter is a good idea. If putting is the best part of your game, then taking the time to be fit for a putter with the proper loft, length, lie, etc., could be a wise investment. However, maybe you're just looking for an upgrade and want to try the latest, greatest thing. Just as a heavy putter can be a good thing for a beginner, the tables can turn, and it could be disastrous for a better player. As your putting stroke improves, a heavy putter can often begin to feel sluggish and unresponsive in your hands. You'll also need to pay attention to the sound of the ball coming off the putter face. Again, a heavy putter may have a dead sound and not give the feedback that you need to continue to improve. Some popular options for this category are the Ping Scottsdale Anser 2, and the TaylorMade Ghost TM-110 Tour. If you're a single-digit player, putting is more than likely one of the best parts of your game. You may even have the first putter you ever played with and have just learned to use it more effectively. However, if you're like most of us, a new putter is nearly always an option. At the top end of the scale are the boutique putters from makers like Bettinardi, Scotty Cameron, T.P. Mills, and others. At this level, you select a basic model and then all of the characteristics -- loft, lie, weight, length, etc. -- are dialed in to your specifications. You can even be custom fit for a putter (though the equipment needed to do so is expensive and thus somewhat hard to find). Expect the price tag for a custom putter to start in the $300 range and go up from there. It's no coincidence the majority of better players use some form of a blade style putter. A blade has come to encompass some pretty radical designs, but at the end of the day, it still qualifies as one. As you strive to shave those last few strokes from your handicap, make sure to consider things like the proper length (many, many golfers use a putter far too long for them) and grip size. Even the grip texture can have an influence on your stroke. The final thing to consider is the long putter. Ten years ago, this was seen as a crutch for poor putting; now, this style of putter has seen a nearly 180-degree turn in acceptance. With players like Adam Scott, Ernie Els, Fred Couples, and many more using some form of a long putter, it no longer has such a negative stigma associated with it. Just like their shorter counterparts, long putters come in both blade and mallet designs and have many of the same playing characteristics. While the information and thoughts above will certainly give you some guidance and direction on choosing a putter, the bottom line is: find the one that feels good to you. 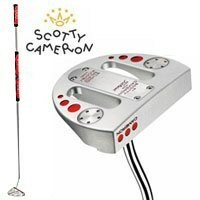 Just because you're a 25-handicap doesn't mean a Scotty Cameron Newport putter won't work for you. If it gets the ball in the hole on a consistent basis, then it is the right putter for you.